Almost all rosy boas have at least some trace of three longitudinal stripes, one down the center of the back, and two on the lower sides. The appearance of these stripes varies widely, from extremely straight and having high contrast with the interspaces, to extremely broken with almost no contrast with the interspaces. Stripe colors can be orange, maroon, rust, brown, or black. Interspace colors can be shades of light to dark gray, yellow, or tan. 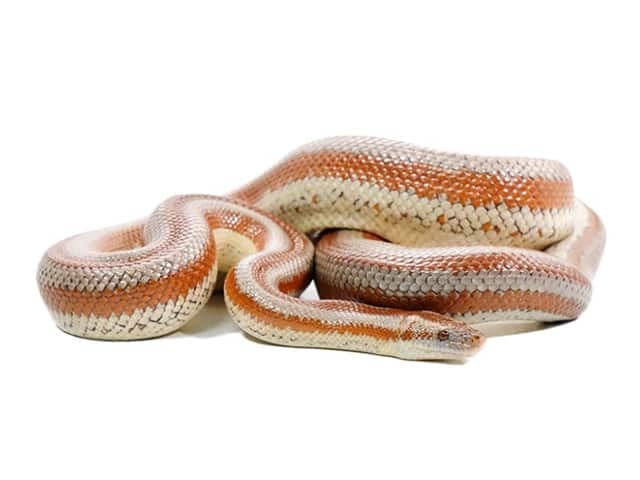 The common name is derived from the rosy or salmon coloration that is common on the belly of rosy boas originating from coastal southern California and Baja Mexico. An enclosure of 1 x 0.5 x 0.5 meters (3.2 x 1.6 x 1.6 feet) is recommended for an adult Lichanura trivirgata but bigger is better especially for coastal locales. Desert and mountain Rosy boas usually grow between 0.6 to 1 meter (2 to 3 feet) long and females are generally much larger than males. The coastal locales and species get the largest, some growing to 1.2 meters (4 feet). Snakes are great escape artists and the biggest requirement of any cage for them is that it is secure. Many household items, such as cardboard boxes, work very well as hides. Pet stores also sell many options that are more pleasing to the eye. A good hide should let the snake wedge itself in firmly, allowing it’s body to touch most of the sides of the hide. But it shouldn’t be able to get stuck in it, rare occurrence but has happened. And you should be able to fairly easily remove the snake from the hide if needed. Provide suitable hides at both the warm and cool ends, so the snake can feel secure at any temperature. There are many types of substrate that work well with Rosy boas and snakes in general. They all have their pros and cons. We personally prefer and use aspen shavings with all our low humidity species. Lichanura trivirgata are from a naturally very rocky environment, sand/soil/gravel mixes work well with them in naturalistic enclosures as long as care is taken to choose cleaned, low dust options. I would not recommend AstroTurf or paper towels except for quarantine. These guys do like to burrow as well as climb and depriving them of that deprives them of a good deal of their natural behaviour. Many are found climbing and basking on rocky outcrops. Never use pine or cedar, as the oils they contain are toxic to snakes. It is recommended to keep your Lichanura trivirgata in a natural light pattern that mimics normal daytime according to the season. Provide a thermal gradient by placing a heat source at the one end of the enclosure. This should allow the snake to choose from higher temperatures (about 32-35 ºC (90-95 ºF)) at the warm end, and cooler temperatures (about 21-23 ºC (70-75 ºF)) at the cooler end. A rheostat or thermostat is almost always needed to keep any heat source you may use from getting too hot. Undertank heaters while they provide belly heat do very little for the ambient temperatures and may not be enough depending on the temperatures in the room. Halogens, ceramic heat emitters and radiant heat panels are also good choices. Ceramic heat emitters also are helpful at lowering humidity levels in the enclosure. Never use a hot rock for heating a snake! Despite what the pet store employee is likely to tell you, they are well known to be a frequent cause of severe burns to reptiles among keepers and breeders. Rosy boas are a low humidity species, so use a small bowl of water to help keep the humidity low. But make sure they always have access to clean water. Rosy boas are a low humidity species and their humidity should be kept low, at least under 50%. Ventilation is arguably just as important if not more important than the humidity in preventing their enclosures from becoming too humid and stagnant. Most Rosy boas take readily to humanely pre-killed mice that you can buy frozen and thaw out to feed to them. Most snakes of the most commonly kept species readily take F/T, as it is also called. If your snake will take it, it is the best way to feed them. It’s a bit more humane for the mouse, safer for the snake, as a mouse old enough to be mobile is capable of injuring or in some cases killing the snake, and it is vastly more convenient for you, the keeper. If your Rosy will not take F/T and you must feed live, be sure to closely monitor the snake through the whole feeding process and be ready to intervene. Newborn Rosy boas usually feed readily on newborn ‘pinkie’ mice, and should be fed about every five to seven days. Increase the size of the meal as the snake grows. One or two adult mice are sufficient every 2-3 weeks to maintain even the largest adult. Rosy Boas don’t usually attempt to bite, although they may do so if restrained. Handle gently, without pinching or squeezing, allowing the snake to move freely through your fingers. Do not let the snake dangle unsupported. Rosy Boas have very strong reflexive feeding response. They have strong tactile sensation along the sides, especially toward the neck, and reaching into a cage and touching a sleeping Rosy Boa may result in an immediate reflexive feeding response. Rosy boas can be voracious feeders and the other common reason for one to bite is being hungery. If your Rosy suddenly starts biting you while you are handling it, adjusting either the size or frequency of feedings can often correct the behavior. If you are using a particulate substrate, you can spot clean periodically every week as you notice waste and completely clean the whole enclosure every one to two months. If using Astro Turf or paper towels, you will want to replace or clean the substrate every week. Having at least two pieces of Astro Turf for each enclosure is best, so you can rotate a clean one for the dirty one, as it takes awhile for a piece to dry after being cleaned. Rosy boas usually shed well at lower humidity but you may wish to provide a humid hide while the snake is in shed. A tupperware container with an entrance cut or melted in it and filled with damp sphagnum moss works well for the purpose. Babies will shed around every one to 2 months or so as they are growing but will slow to around three or five times a year once they have attained their adult size.